Summer might just be my favorite season and I’m probably not alone. It’s the best time of year for me to enjoy all sorts of fun outdoor activities. 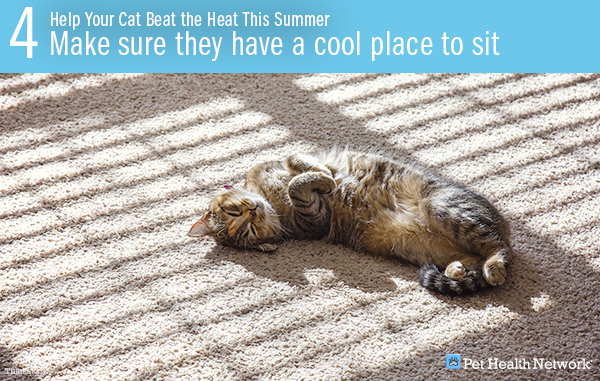 While cats tend to tolerate the heat a little better than dogs, and even prefer it (we’ve all seen a cat stretched out on a sunny windowsill), that doesn’t mean that you should forget about feline heat risks this summer! This may apply more to the canines, but if you have a vet appointment for your furry feline and decide to make a quick stop at the supermarket-- think again! 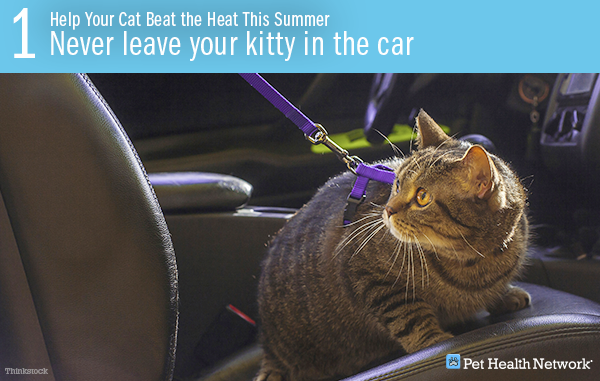 It can take minutes – yes, MINUTES – for a pet to develop heat stroke and suffocate in a car. Most people don’t realize how hot it gets in parked cars. On a 78 degree day, for instance, temperatures in a car can reach 90 degrees in the shade and top 160 degrees if parked directly in the sun (Check out Dr. Ernie Ward's video to see for yourself)! Your best bet is to leave your pet home on warm days. Our cats get much thirstier than we do when they get hot, and other than drinking, they really have no way to cool themselves down, so be sure their water is always fresh. You can keep it cool by adding a couple of ice cubes as well. 3. Try whipping up some 'catsicles'! Once you have everything ready, start mixing your ingredients (if you decided to use treats as well, the mixture should look a lot of like cookie-dough). After you've mixed everything, fill the plastic cups about 1/4-1/2 an inch and flatten the mixture by stacking the cups. Place Saran Wrap over the top cup to avoid freezer burn and freeze overnight. The next morning, run the bottom cup under warm water until you can pull it off of the stack and pop out the mixture which should now be a nice, round catsicle! Place it in a deep bowl (to avoid messes) and let it stand until the outside starts to "sweat". 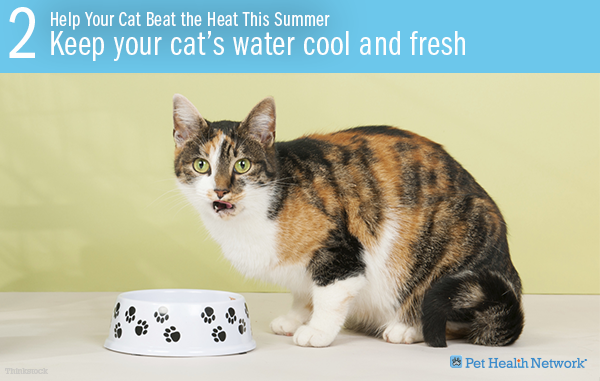 Finally give the cool treat to your feline! Watch the video below to see how my crazy kitties enjoyed them! While indoor cats have plenty of shade options, they love to sunbathe and direct sunlight can overheat them and cause heat stroke. Another idea is to give them a cool place to sit, kind of like a reverse heating pad. Freeze a water bottle, wrap it up (so it doesn't stick to their hair/skin), and place it under a lightweight blanket or towel in one of their favorite places to sit. 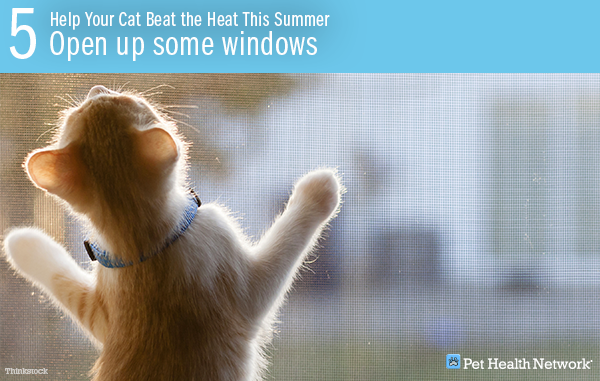 Knowing cats love windowsills, always make sure your screens are fully secured before opening a window. You may want your house to be ventilated, but you definitely do not want your kitty to fall out! 6. Believe it or not, cats can sunburn! 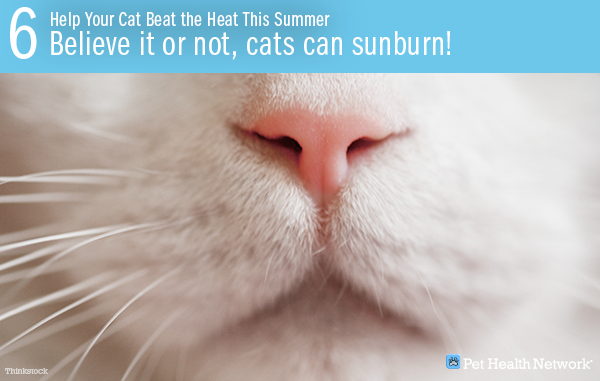 Just like for people, sunburns can be painful for a cat and overexposure to the sun can lead to skin cancer. Most cats have hair that protects them from sun damage. However, hairless cats, like the Sphynx, are highly susceptible to sunburns, especially in areas like the ears, nose, lips, eyelids and belly. Talk to your veterinarian about sunscreens for your kitty (don’t assume a sunscreen for people is appropriate for your cat).